Those same eyes that had seen me in some of my darkest moments looked back at me. yet it felt like a vast distance separated us. My friend no longer seemed like the girl I once knew. I longed to see the same smile that had reminded me of what hope feels like. I ached to see the light come back into her eyes and to eagerly talk of our hopes and wild dreams. and I angrily asked why? Why does my dear friend have to go down this path? Why is she choosing to leave me in this way? Why can't she see the darkness of the place she's has fallen to? 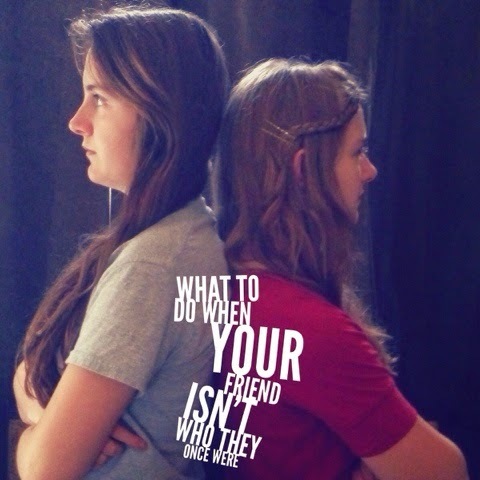 What do we do when our friends no longer seem to be the people we once knew? The pain at how they hurt themselves stings. The pain at how they've hurt us in the process feels like hydrogen peroxide poured in an already open wound. Sadness. Anger. Frustration. Hopelessness. It all leaves a bitter taste in our mouths contrasted to the sweet friendship we once knew. However, God's hand still works even when we cannot see it, and He always has a purpose in the pain. The truth is, your friendship with this person has altered. This new season in your relationship is going to bring change in your interactions. You may have daily text-ed, facetimed often, hung out at least once a week, encouraged each other frequently, and always felt super close whenever you saw each other. and the absence can leave you sometimes angry even though you might not know why. Here's a tip: stop and examine your expectations (cause they are going to need some change). If you and your friend are drifting apart, those habits are no longer normal and expecting them is only going to bring you constant disappointment. To save yourself pain, you must change your expectations for how close your friendship is and how you expect your friend to treat your relationship. Then, you may have to live with this "new normal," these new expectations, for a season. Because we live in a cause and effect world, this person's change has affected you. You are responding in some way. Often, when close relationships become more distant, unhealthy emotions can surface: anger at your friend for making destructive choices, frustration at being neglected and at perhaps witnessing others take your place, etc. Get on your knees before the Father about this relationship before these emotions are allowed to surface in negative ways. Let Him deal with your own heart, so that you are able to deal with the person in a Christ-like way. Let Him sooth your anger and replace the hurt with His love. Ask Him to guard your attitude and words as you interact with this person so that you may continue to respond in love. You know who your friend used to be. You know that God still has amazing plans for them and wants to use them in glorious ways. They need you to not give up on that person who seems to have disappeared. Yes, your friend may not always need to be lectured that they have made so many bad choices and are going to ruin their life and such. However, neither do they need your acceptance of their behavior. Don't be afraid to let them know where you stand. Let them know that you still believe in them, that wonderful plans are in store for them, that God wants them to surrender their lives once again, but you may need to make it clear that you aren't going to bend from the Bible; you won't support ungodly choices. You may need to say no to some of what they may want you to participate in - activities that are beyond what you feel is leading a God-honoring life. When appropriate, you can challenge them to live up to the life God has for them, as well, because His plans are the absolute best for us; He can do immeasurably more than all we ask or think (Ephesians 3:20). Pray that they will come back to the King. Pray that they will let Him work in their heart. Pray that they will bow in surrender to all that He has.